Eating too much sugar not only adds inches to your waistline, but also fuels inflammation, which is a major cause of many chronic diseases. 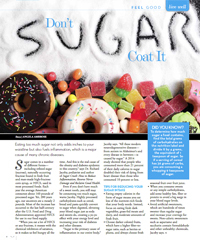 Sugar comes in a number of different forms – including refined sugar (sucrose), naturally occurring fructose found in fresh fruit, and man-made high-fructose corn syrup, or HFCS, used in most processed foods. Each year the average American consumes about 160 pounds of processed sugar. Yet, two hundred years ago, our ancestors ate a measly two pounds. Most of the increase has occurred in the last half century, after the U.S. Food and Drug Administration approved HFCS for use in our food supply. Even if you don’t have much of a sweet tooth, you still may be consuming too much sugar, warns Jacoby. Highly processed carbohydrates such as cereal, bread and pasta quickly convert to sugar when digested, elevating your blood sugar just as soda and sweets do, creating a yo-yo effect with your energy level and increasing your risk of diabetes and other diseases. Eating empty calories in the form of sugar means you eat less of the nutrient-rich foods that your body needs. Instead, focus on eating fresh dark vegetables, grass-fed meats and dairy, and moderate amounts of fresh fruit. Choose darker colored fruits, which have a higher fiber-to- sugar ratio, such as berries or plums, and always choose fresh seasonal fruit over fruit juice. When you consume sweets or any simple carbohydrates, add some healthy fats, fiber or protein to avoid a big surge in your blood sugar levels. Avoid artificial sweeteners, which are hundreds of times sweeter than regular sugar and increase your cravings for sweets. Non-caloric sweeteners such as aspartame and saccharin contain formaldehyde and other unhealthy chemicals, says Jacoby. To determine how much sugar a food contains, find the total grams of carbohydrates on the nutrition label and divide it by 4 grams, the equivalent of one teaspoon of sugar. So if a serving of frosted flakes cereal has 36 grams of carbs, you are consuming a whopping 9 teaspoons of sugar.